· Ryan Newman won the 13th annual Camping World 500 Monster Energy NASCAR Cup Series race at Phoenix Raceway Sunday afternoon. For Newman, it is his 18th victory in 552 Monster Energy NASCAR Cup Series races. It is his first win since July 28, 2013 at Indianapolis Motor Speedway. Since that time he had gone 127 straight races without a victory. · This is Newman’s second victory and 12th top-10 finish in 30 Cup starts at Phoenix Raceway. His previous victory at Phoenix Raceway occurred on April 10, 2010. · With the victory, Richard Childress Racing ends a 112-race winless drought. Its last win prior to today came at Phoenix on November 10, 2013 when Kevin Harvick took the checkered flag. · With today’s win by Newman, there have been four different winners in the first four Monster Energy NASCAR Cup Series races of 2017. It is the second straight year and sixth time in the last seven years dating back to 2011 that this has happened. · Kyle Larson (second) posted his third top-10 finish in seven Cup starts at Phoenix Raceway. It was his third straight second-place finish and his fourth in his last five races dating back to last year, including the season finale Ford EcoBoost 400 at Homestead-Miami Speedway. · Kyle Busch (third) had his 16th top-10 showing in 24 Cup starts at Phoenix Raceway. · Daniel Suarez (7th) was the highest finishing rookie. · Joey Logano won Stage of 1 of today’s Camping World 500, while Chase Elliott took the green-checkered flag in Stage 2. · Kyle Larson (184) leads the point standings by six points over Brad Keselowski (178) and 13 points over Chase Elliott (171). · With the win, Ryan Newman becomes the fourth driver to qualify for the 2017 Monster Energy NASCAR Cup Series Playoffs, joining Kurt Busch, Brad Keselowski and Martin Truex Jr., winners of the first three races of the season. The Playoffs culminate with the Ford EcoBoost 400 championship finale on November 19 at Homestead-Miami Speedway. 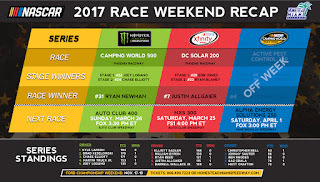 · In 15 career Monster Energy NASCAR Cup Series starts at Homestead-Miami Speedway, Ryan Newman has posted five top-10 finishes, including two top 5s. His best finish at Homestead-Miami Speedway occurred in the 2014 Ford EcoBoost 400 when he finished second, as he was part of the inaugural Championship 4, finishing just behind champion Kyle Busch. 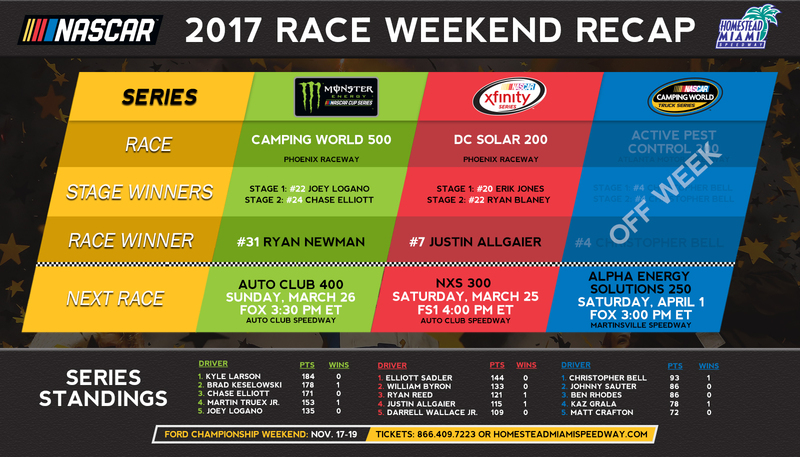 · Justin Allgaier won the 11th annual DC Solar 200 NASCAR XFINITY Series race at Phoenix Raceway on Saturday afternoon. It is Allagaier’s fourth victory in 211 NASCAR XFINITY Series races. · It is his first victory and ninth top-10 finish in 14 XFINITY Series races at Phoenix Raceway. · Ryan Blaney (second) posted his second top-10 finish in as many XFINITY Series races at Phoenix Raceway. He also won Stage 2 of the race. · Erik Jones (third) posted his sixth top-10 finish in as many XFINITY Series races at Phoenix Raceway. He also won Stage 1 of the race. · William Byron (fourth) was the highest finishing rookie. field in the 2017 NASCAR XFINITY Series playoffs. The playoffs culminate with the Ford EcoBoost 300 XFINITY Series championship race at Homestead-Miami Speedway on Saturday, November 18. · Elliott Sadler (144) leads the XFINITY Series points standings by 11 points over rookie William Byron (133), winner of the 2016 Ford EcoBoost 200 Camping World Truck Series race at Homestead-Miami Speedway. They are followed by Ryan Reed (121) and Justin Allgaier (115).